Jin-Machine started their activity in 2006. Although they categorize themselves as so-called "Visual Kei", their gigs (they call them Mass) have essence of comedy animation and otaku contents. They are not only a music band but also a entertainment group.They did an opening act at V-ROCK Festival in 2011. Their latest single, "Natsu Daisuki Visuak kei (We love summer! 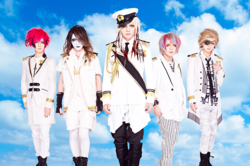 Visual kei) ", consists of various genre such as V-rock, reggae and pop. People can enjoy Jin-Machines's unique "absurdity" and "humor" through this big piece. The mix of phrase across the genre will definitely allure you into a Jin-Machine's world! Let's sing! Dance! and Laugh together with that summer song of Jin-Machine!